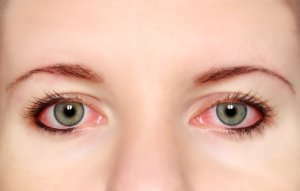 The redness associated with “red eye” is usually caused by dilated or swollen blood vessels. As a result, the surface of the eye looks bloodshot. In contrast to vision problems or pain in the eye, red eye is often less of a concern. However, there are times when red eye may be a sign of a more serious condition. Short periods of red eye that happen occasionally are not usually a problem. They may clear up on their own after resting your eyes or avoiding anything that was irritating them. If you are experiencing long-lasting red eye or red eye combined with any of the symptoms listed above, call us today to schedule an appointment, so we can assess your eye health and provide any necessary treatment options.